As we wind down the data-gathering and analysis for 2016, we’ve queried Chain Store Guide’s Database of Discount, Dollar & Specialty Retailers to compile our Top Ten list of the largest discount, dollar and general merchandise stores in the United States as determined by the latest store counts. In addition to these stores, the aforementioned database contains thousands of specialty retailers in categories such as books; cards, gifts and novelties; pets; toys, hobbies and crafts; and office supplies and stationary. Here, then, are the Top Ten at the end of calendar 2016. 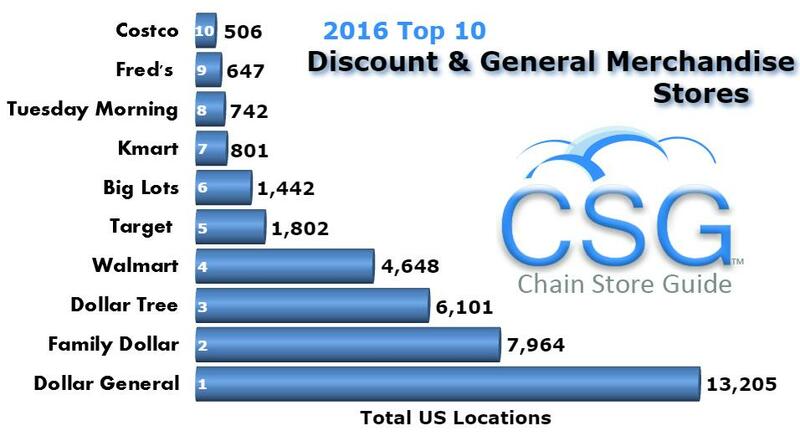 Source: Chain Store Guide’s Discount, Dollar & Specialty Retailers Database. • Dollar General added 722 net new stores through Q3 and looks set to meet the goal of 900 additional stores in fiscal 2016 (ending 1.30.17), the largest one-year increase in company history (until 2017 when the target is 1,000). • The number of Family Dollar banners have increased by 60+ stores this year with new store openings outpacing store closings and store rebrands (to Dollar Tree). Those rebrands and 300+ new store openings through Q3 have boosted Dollar Tree US store counts north of 6,100. • Walmart’s projected 130 new stores in the current fiscal year will be more than halved to 55 for the next. • Kmart shed 140 stores in the first three quarters of the year. • Fred’s store count remained relatively flat, but a December announcement points to 40 store closures in the first half of 2017 as part of the company’s transformation into a healthcare-focused company. As the companies in this space close out their books for the fiscal year (with many ending in January), Chain Store Guide will be capturing all of the year-end data from store counts and location data to sales figures and personnel contact information. By doing so, we help ensure our customers and clients have the most accurate and accessible data in the business to start 2017.